El Diablo is the rooster to top all roosters, mainly because his roo-fro is beyond awesome. He's a Polish Crested and, as such, has an entirely useless feather display attached to his head. Hens don't find it all that attractive but people do. Anastasia is the tiny little hen on the right. She's a recent rescue and much younger than Diablo. 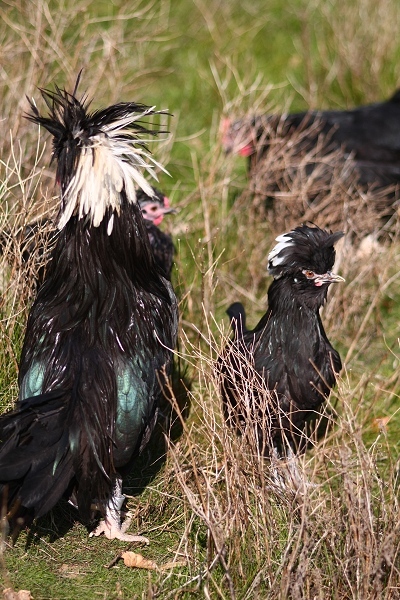 She too is a Polish Crested with a much softer hen-fro. I had high hopes for these two. Certainly, once they made eye contact, sparks would fly, the heavenly chick-angels would sing, and love would permeate the air. So when I saw Anastasia approach Diablo I thought, this is it! My camera was up, finger hovering above the shutter button, waiting, waiting, waiting. SNAP! I frowned, where was the spark, the connection? No eye contact. No feather preening. No manly, rooster dances. No demure hen clucks. Nada. In fact, Anastasia wouldn't even look at Diablo. He wouldn't look at her. Are they playing hard to get? Certainly, not looking at each other facilitates that technique. I don't think I realized that the sanctuary allows breeding. What do they do with resulting offspring? Sorry, I should have clarified that! We don't allow any breeding - we collect all the eggs daily. However, there are some crafty hens who have hidden their nests and managed to hatch a clutch. It's happened three times in the past six years. The offspring remain with the flock at the sanctuary. The most recent clutch was seven, including three roosters -ouch. The other two were two baby birds each, three of whom have since died. I rather like the poofy chickens. What do you think of chickens as pets? I love them, they're such funny looking animals. I think chickens can make wonderful companions in the right home. Of course, adoption is the way to go IMO as hatcheries aren't the happiest of places and they ship day-old baby birds w/o food/water for up to 72-hours via the postal service (yuck). I used to do this when we (or rather, our landlords — sigh) hand chickens, except I didn't bother boiling them. Do you think it's necessary? It was a rec'd from a poultry expert at UC Davis, it's also what Farm Sanctuary does. We used to just give them raw when the flock was small - I think it's fine for small flocks. But when you're getting 40-60 eggs a day, it's healthier and more accessible for the birds to boil them up, crush them up and give them back. DAMN IT, MARJI, POOFY HEADED BABIES FTW!!! This times like 5 billion. THEY WOULD BE SO CUTE YOU'D ALL BE DEAD. So, if you want a long life, be happy these two aren't getting it on day and night! Maybe it'll be a slow-blooming chicken romance? Also, holy crap, you have the coolest job ever. I'll keep the hope alive, but I have a feeling Anastasia just isn't impressed with Diablo. She is, however, very impressed with my boots.